Last week I continued my minimal hunting schedule, focusing instead on getting organized on the business side of things. I did some culling of my yard sale stuff, putting about seven boxes of less salable stuff back to the curb. I made sure that the boxes were visible, and as a result the vast majority was taken by other pickers. I did this to make more space for better stuff and to reduce clutter in general. I also spent a fair bit of time listing things on eBay. Several of the items I listed sold within days (and sometimes within hours), which was pretty awesome. My sales have been great lately. According to eBay, I’ve sold nearly an item a day over the past two months, which seems pretty good considering how small my store is. I’ve been getting a lot of good feedback too – my score is now up to 94. Getting to 100 will be a milestone for me! I have a lot more listing to do, but I do feel like I’m getting caught up. The pickings were slim last week, unlike the week prior. The enigmatic dumpster only ever got this full, and didn’t even get taken away this Monday as the previous bins did. I guess whoever is filling it was busy with other things. Most of the bags were full of old magazines, but none of them were particularly interesting. I spotted this container sitting on a shelf at the left hand side of the bin. 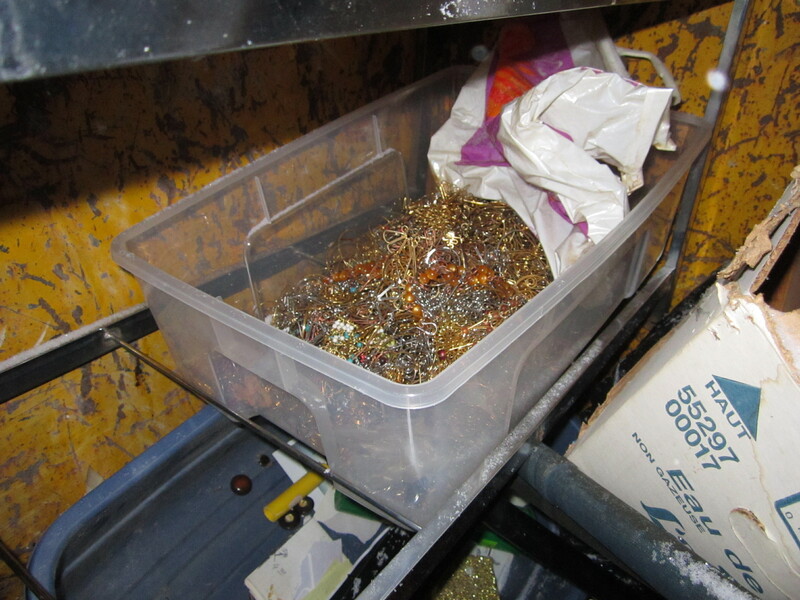 It was full of bits of jewellery, many of which seem hand-made. Some were complete, while others are just nice metal shapes. 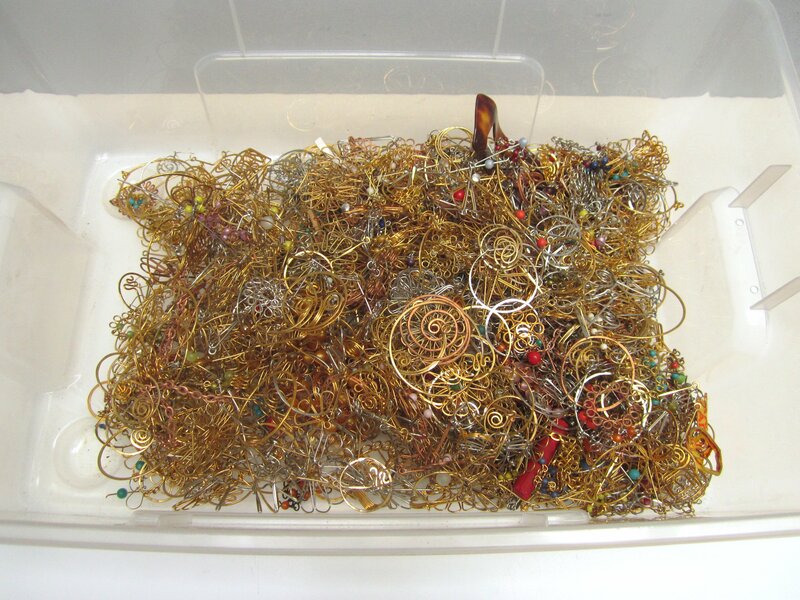 The bits come in gold-tone, silver-tone, and copper-tone. They have that old metal smell, but that cleans up easily enough. I’m thinking it might be cool to sell a few, and use others for arts and crafts projects. 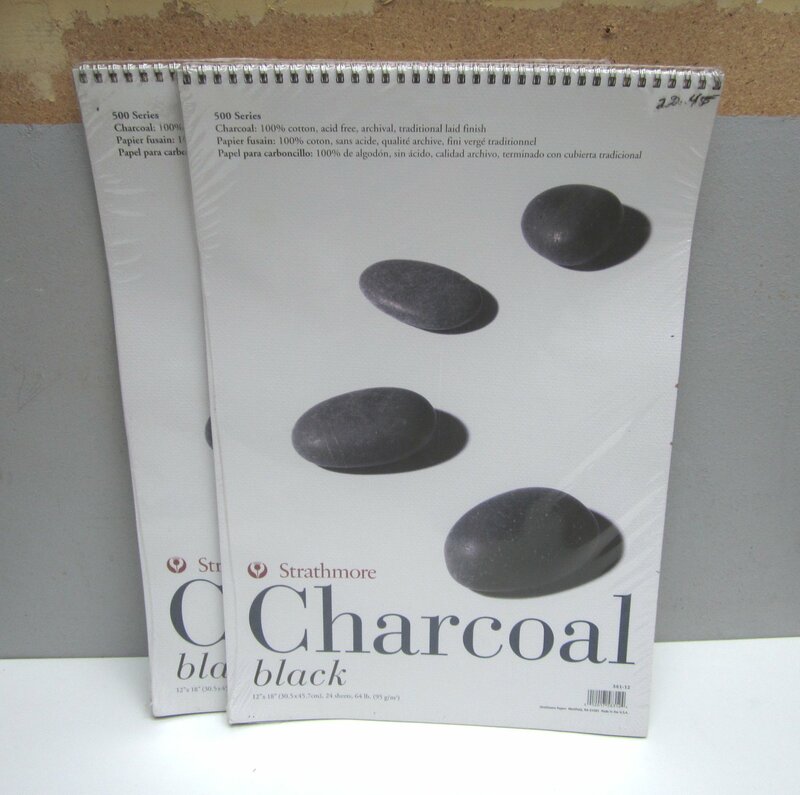 I also saved two packages of charcoal art paper, still in their original plastic wrap. Both are marked 22.45$ at top right. I found two old alligator (crocodile?) handbags at a spot in Hampstead. They seem to be made of legit leather. Neither are in good condition (though the one on the right is decent outside of the broken handle), but I figure someone might want to recycle the leather. I saw nothing in front of my spot in Verdun, making me think it might be the end of the line for that particular place. However, a spot in Cote St-Luc provided a couple useful things, including: two nice vintage staplers; a JFK memorial magazine; a wallet with old Israeli coins inside; an empty vintage wedding journal; some kind of Hebrew scroll; and a few other doodads. Overall, it was my slowest week in quite some time. Most of that was probably due my minimal schedule, though who knows if I would have found anything regardless. 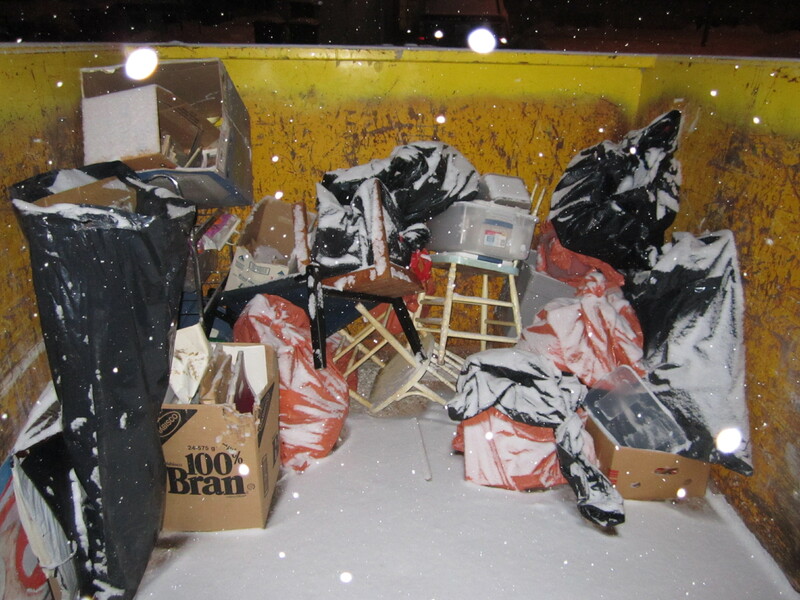 Mid-February definitely isn’t the best time to find garbage, at least here in Montreal. I may not have many finds to talk about, but I did make a bunch of sales! 1. 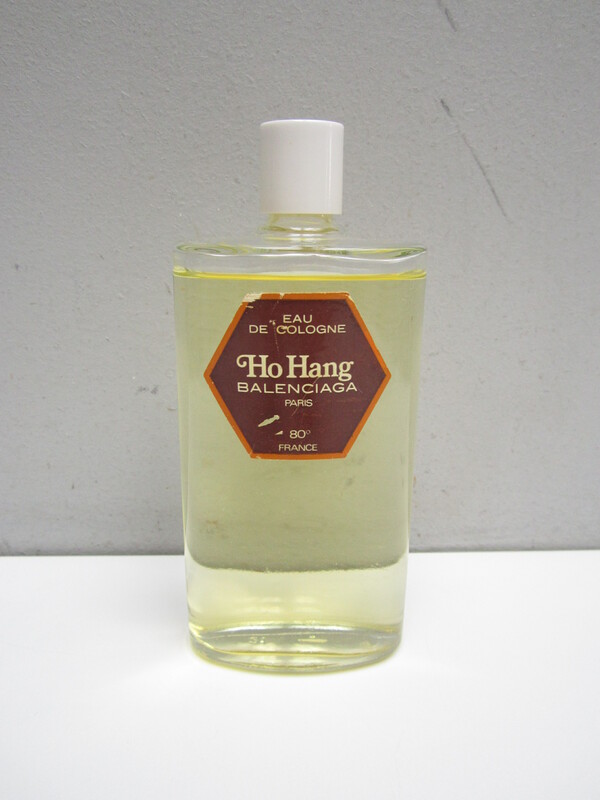 Ho Hang vintage cologne: On eBay for 85$. This sold within hours of my listing it. I think I found it at my spot in Hampstead, though it could have also been from Cote St-Luc. Regardless, it never made it to the blog. I’m pretty happy with the money! I never would have guessed that I’d be making good money selling old scents. 2. Vintage Dunhill cardboard pipe box: On eBay for 30$. This had been sitting around my room for a long time, waiting for me to fix it up a bit and list it. Last week I finally did, and it sold within a day of being listed. I’m glad to see it leave my home. This was the last remaining item from the box of old pipes and pipe accessories that an older man kindly gave me this summer in Mount Royal. 3. Small vintage banner – Game 8 of 1972 Summit Series: On eBay for 85$. I came across this again when organizing my old stuff. 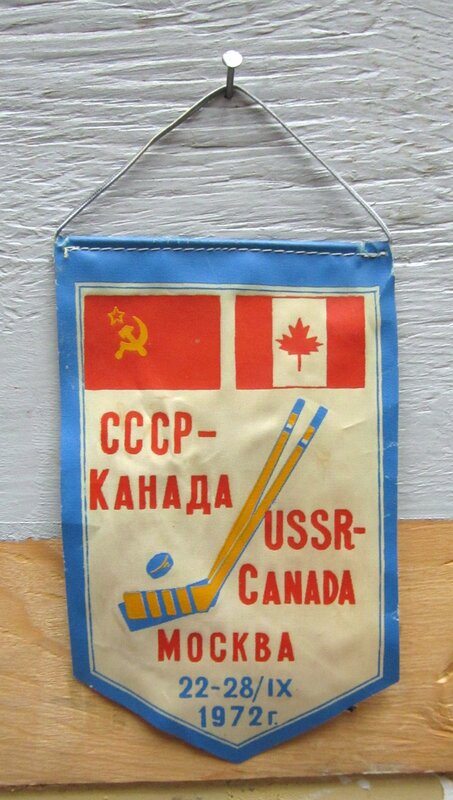 I did a bit of research and found that it was a banner from the famous Game 8, where Canada beat the Soviets thanks to a late goal by Paul Henderson. It sold very quickly, making me wonder if I should have charged more. Regardless, it’s a good price! Found this fall in Cote St-Luc, but it never made it to the blog. 4. Guerlain Shalimar dusting powder: On eBay for 44$. Another item I listed this week that sold fairly quickly. Found around a month ago in Hampstead. 5. E.E. 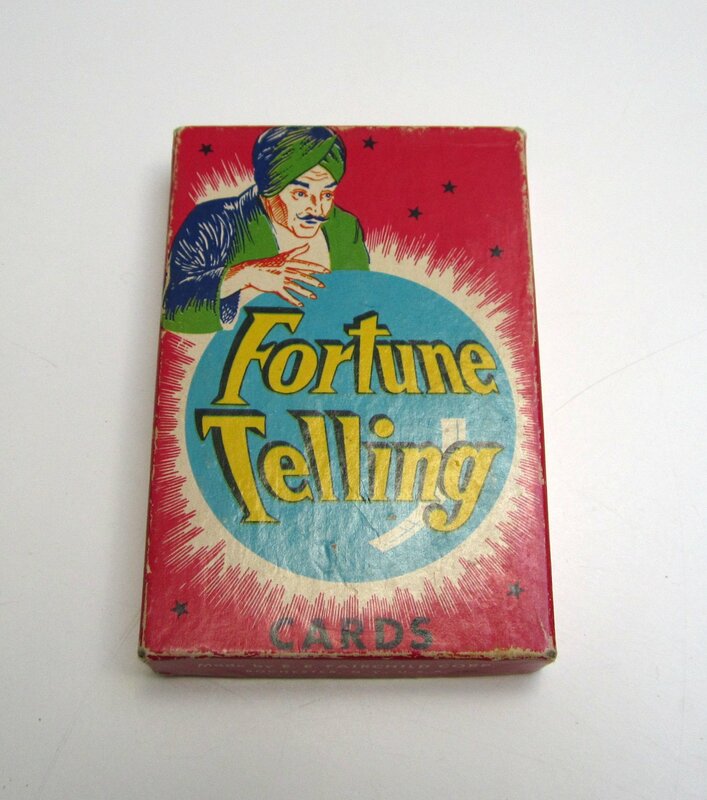 Fairchild fortune telling deck: On eBay for 35$. Yet another item listed this week. It’ll be hard to keep the store stocked if things keep selling at this pace! Found a couple weeks ago in Verdun. 6. 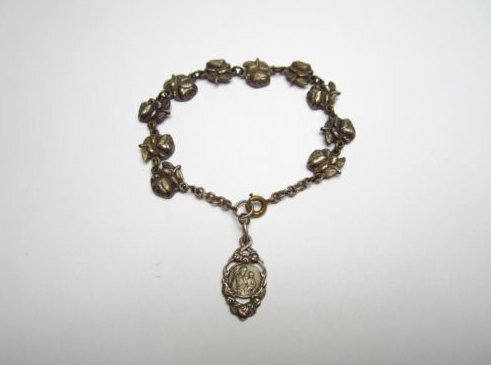 St Joseph’s Oratory charm bracelet – 1920s-1940s: On eBay for 90$. I was speculating a bit on the price when this was listed, but it ended up making me a nice chunk of change. I thought it was a very beautiful. Found in May in Verdun. 7. 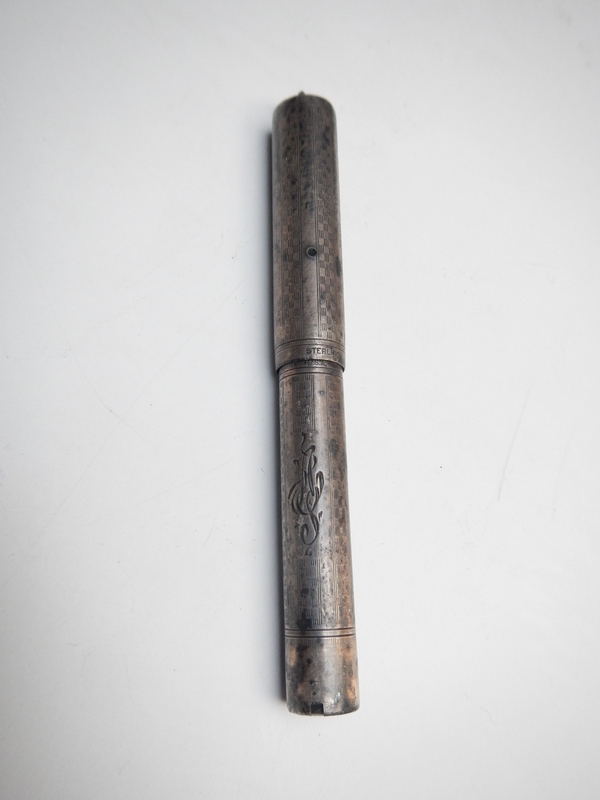 Sterling silver Waterman “Ideal” fountain pen: On eBay for 150$. This received a fair bit of interest, and finally sold this week. Found early August in the Plateau next to Jeanne-Mance park. 8,9: Two Expo 67 Passports: On eBay for 70$. A buyer from China bought both, as well as another passport I had from the 1935 Expo in Brussels. I’ll add that Brussels passport to the profit total next week, as they bought that piece on Monday. 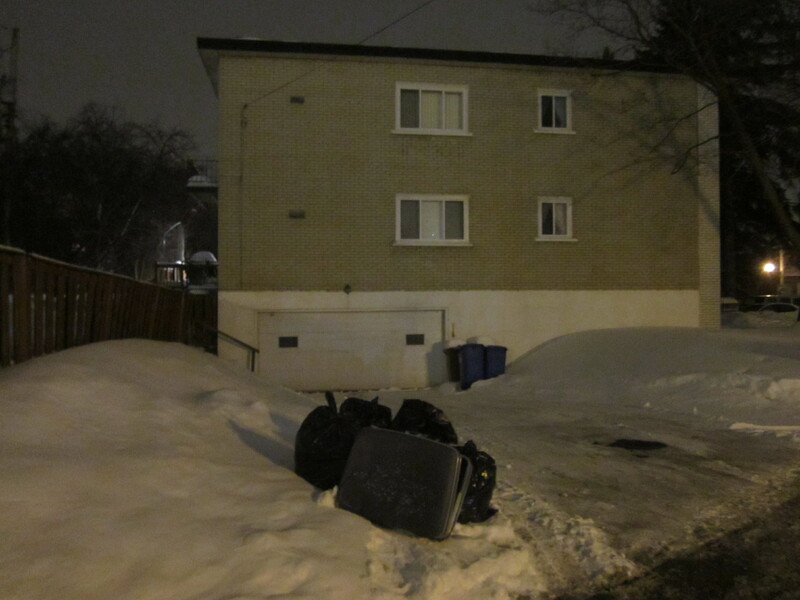 Both of these were found this fall in Cote St-Luc. Total: 589$, 12257$ since May 18 and 2574$ since the new year began. A very nice week, largely due to my listing several new items. I also sold some broken Blackberries, I didn’t add them to the total as the payment hasn’t come through yet. I offer a discount to local buyers who can come pick up the item themselves (and preferably pay me in person, saving me the eBay fees). Email me if you’re interested in anything you see. glad to see how awesome you’re doing!!!!!!!!!!!!! must be looking forward to summer already. i cant stay outside for more than 1 minute! Look on the bright side, come Saturday it’s about four weeks to the end of March. And Sunday it’s a week until dst kicks in, already it’s a lot brighter at 5pm. Now’s the time to make those lists of what we hope to find at garage sales and in the garbage. Warm weather will be hear before we know it. Yeah, definitely looking forward to it… everything is so much easier, and I get to do yard sales! 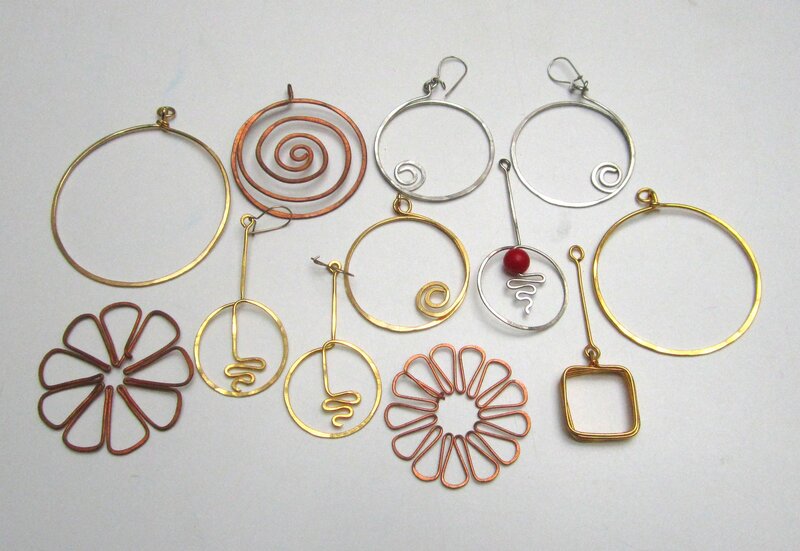 That metal jewellery will be very nice for crafting. I expect it would sell well at your yard sale. You’re doing well! Keep listing. I’m sure you have more treasures waiting in the corners to be sold. yves st laurent opium blocked due to legal restrictions ebay? pat. Don’t know if you’re interested, but this story was at close of NBC Nightly News today. http://www.nbcnews.com/nightly-news/video/professional-dumpster-diver-turns-trash-into-treasure-403807811531. Hope this link works; if not, search for NBC news site. I really enjoy your blog! I hadn’t seen the video before, only the Wired article. I find it all a bit fishy, to be honest. I wonder if some of the prices he states are inflated for effect (for example, like they do in “Storage Wars”). Many people on a dumpster diving message board I frequent seem to think the value of some of the objects he’s found (as mentioned in the Wired article) are much less than stated. It’s hard for me to be sure, as I’m not a tech expert, but it does all seem a bit too good to be true. We saw that NBC story last evening, as well, and recorded it for you. Now that you’ve seen it, I’ll delete. I was wondering about his figures too.